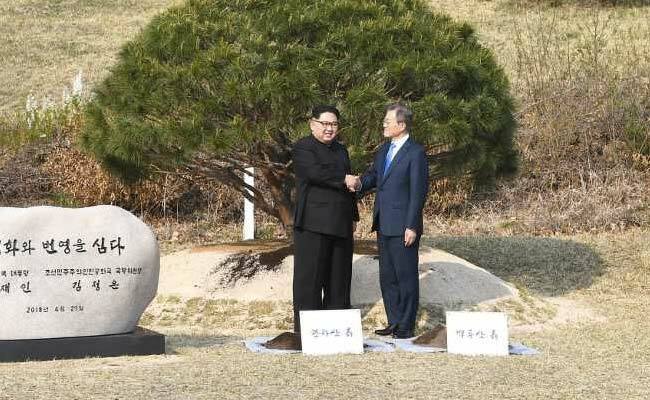 The leaders unveiled a smooth standing stone in front of the tree inscribed: "Peace and Prosperity Are Planted" before posing for photographers. Seoul, South Korea: The last time South Korea's President Moon Jae-in was on duty for a tree-related event in the Demilitarized Zone, it involved 813 troops, 27 helicopters, B-52 bombers with fighter escorts -- and an aircraft carrier prowling offshore. As a young serviceman, Moon played a supporting role in "Operation Paul Bunyan", likely the most expensive tree-felling in history, when US and South Korean troops cut down a poplar whose leaves were blocking strategic views. 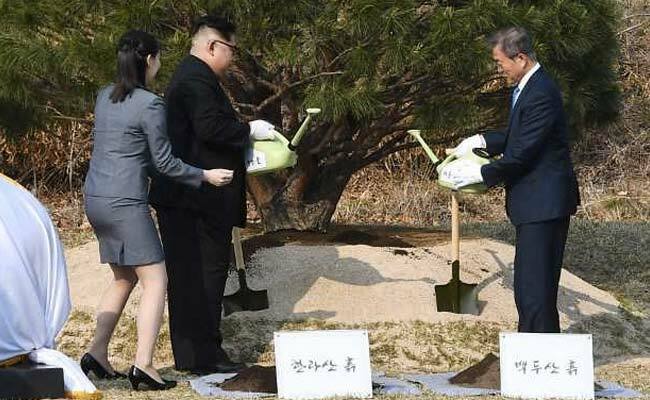 On Friday, he swapped military hardware for a metal shovel as with North's leader Kim Jong Un he took part in a ceremonial tree-planting next to the Military Demarcation Line that forms the border between the two Koreas. In bright afternoon sunshine, the pair donned white gloves, grabbed shovels and tossed soil from mountains in both countries to the base of the already firmly installed pine. It was germinated in 1953, the year Korean War hostilities ceased with an armistice rather than a peace treaty. Armed with bright-green watering cans, Moon then poured water from Pyongyang's Taedong river and Kim watered the tree from the Han river in Seoul. "We Koreans say pine trees are strong and they are green all around the year, even in winter as well," Kim said. "Like pine trees, we have to overcome challenges that may come before us down the road." Then the leaders set off down a path for a stroll alone, with no aides alongside. It was all a far cry from the dramatic 1976 tree-felling aimed at removing branches that were obstructing the view of US-led United Nations forces. At the time Moon was doing his compulsory military service and was among the special forces soldiers held in reserve nearby, ready for action if there was any intervention by the North. An earlier attempt to prune the tree saw North Korean soldiers kill two US officers with their own tools in what was dubbed the "Axe Murder Incident" and prompted the overwhelming show of force. A furious US President Gerald Ford ordered a massive military operation -- codenamed Operation Paul Bunyan after a giant lumberjack in American folklore -- to fell the single tree. A joint mission involving Korean and US special forces, combat engineers with chainsaws and martial arts experts steamed into the DMZ. The whole of the US and South Korean forces on the peninsula were put on full alert and the tree-felling unit had back-up from B-52 bombers, F-111 and F-4 fighter jets, and the USS Midway aircraft carrier with its full battle group patrolling off the coast. It took 45 nerve-wracking minutes to fell the offending poplar, while scores of heavily armed North Korean soldiers stood close by observing, but not a shot was fired. Later that day, in an uncharacteristically conciliatory message, then North Korean dictator Kim Il Sung expressed "regret" over the killings of the two soldiers and voiced hope that such incidents could be avoided in the future. "That's when my view of our country and security as well as my patriotism were formed," Moon told a television interviewer during his election campaign last year, promising to "restore peaceful relations with North Korea".